A coffee is most of our daily need and finding time in our tight and busy schedule to make coffee in traditional coffee maker can be tiresome and irritating. Single cup coffee maker is not just easy to use, small and doesn’t cause much trouble to the user. Just one button can get you a freshly brewed coffee without any hassle. These coffee makers will not only save your time but will also go easy on your pocket. If you are planning on getting a holiday gift then you must try a single-serve coffee maker that is not only simple and small but also eases your workload. There are a number of coffee makers available in the market with some stupendous features. Here, are a few of them that are best in the market and will help you choose from. Keurig 2.0 is known to be the best product in the market. From sleek design to easy to use features, all speak of a perfect coffee maker. If you are seriously planning on buying a single serving coffee maker then you must go for this one. This one is known to make your coffee making a simple and easy task. The reservoir is detachable which makes it easy to clean and fill the reservoir. You can easily brew a big single cup or a carafe for even a house party as well. The machine is compact and easily portable but one can easily brew all kinds of cup sizes from 4 oz to 40 oz. you can also use My K-cup filter for the coffee, which adds a special touch to the product. For the coffee bean users, this product can be good news, as they can easily grind the coffee beans to prepare a fresh cup of coffee each time. For this, you may go for My K-cup filter which can prove to be a very good option. This product makes it easier for everyone to brew coffee in a jiffy. Even an inexperienced person can use K250 to brew a fresh cup of coffee. The elegant design of the coffee maker makes it very appealing. The other important feature of this machine is that it comes with a water level window that gives you strength control. 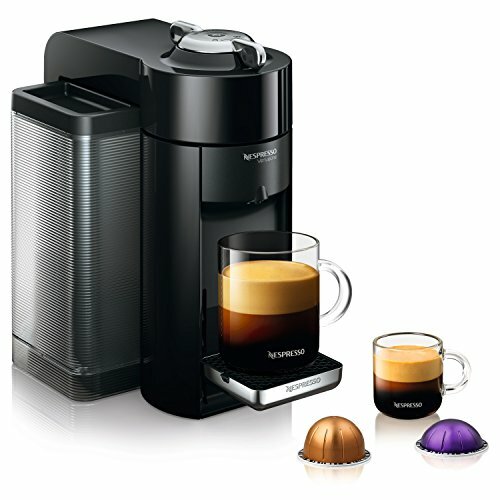 Nespresso VertuoLine Evoluo Deluxe 4.0 is known to be one of the best products in the market. If you are planning to buy a beautiful single serving coffee maker those appeals to everyone’s eye, then you must go for this one. However, looks come secondly as this one is known to make your coffee rich in taste with consistency. The centrifusion technology helps the machine to brew the best-tasting coffee. Nespresso VertuoLine comes with the capsules that make the product work and it works only on these capsules. The machine comes with used capsule holder separately and can hold up to 17 capsules in one go. This particular machine can make the choice of your drink with same consistency every time you brew a fresh cup of coffee. You can work with two-cup sizes, which makes its application worthwhile. The precision code reading technology is the reason behind its consistency in providing the same taste to the coffee. With the help of capsule recognition technology, the product is able to take accurate measurements of water and particular temperature to brew your coffee. This particular Nespresso model is better and hotter than its previous models. Other than that, two pod sizes that can be used with the machine. For strong espresso one can choose a smaller capsule and for cappuccino or latte one can use the bigger one. You can see this product fitting with your other household appliances easily. This product is known to make different varieties of coffee without any hassle. You can also use milk frother separately with the machine as it compatible with it as well. It only takes a few minutes to make great latte, cappuccino or espresso with great taste. So, you can enjoy a great variety of brew. Keurig K55 is as simple and easy to use as it gets. If you are the kind of person who doesn’t like the hassle of using complex coffee machines using coffee beans, then this one will be perfect for you. This is the machine for those who want their daily cup of caffeine fix served within two minutes. There are four complimentary K-cup pods, which come with the coffee maker and it serves your cup of aromatic coffee with a single touch of the button. Instant coffee never sounded better! The reservoir is of 48-oz that holds around six plus regular cups of coffee at one single go. The machine comes with two water-filters as well as one extra water-filter. The auto shut off feature of the coffee maker is another plus. The three K-cup pods of 6 oz., 8 oz. and 10 oz. work perfectly with this coffee maker. Large buttons translate to the easy usage of the machine for anyone and this makes for a hassle-free and amazing coffee making experience every day. Depending on the model, one can select many brewing options in the settings such as brew size, temperature, beverage selector and bold selector. Keurig coffee makers come with an Auto-brew option for K-carafe, which allows you to select the brew time and then does the job it is meant to do perfectly. The three K-cup pods available with the machine allow you to choose the type of coffee you want. A use and care manual will guide you about the various operations of the Keurig K55 coffee machine. The sleek and modernized design is a plus for your kitchen. But there is no option for controlling the strength of the coffee. If you want a stronger than usual brew, the 6-oz. the pod will do the job. 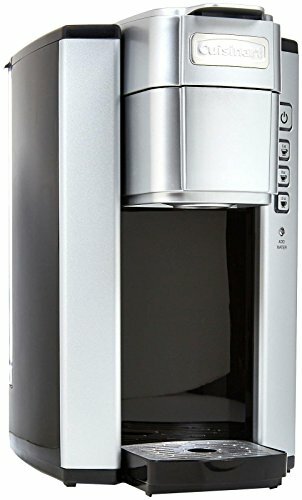 The reservoir for water is also detachable in this machine, just like other Keurig models. The auto-shutoff is activated when the coffee maker is left idle for more than ninety seconds. These are the reasons why the K55 model is most popular among all other coffee makers from this brand. This one is the espresso specialist. This coffee machine will freeze your belief in the Nespresso coffee machines with the very first use. The superb coffee maker was introduced by De’Longhi and is the dream coffee machine for the morning espresso lovers. The preheat time of the machine is a short span of twenty-five seconds and it prepares the coffee within two minutes of pressing the button. 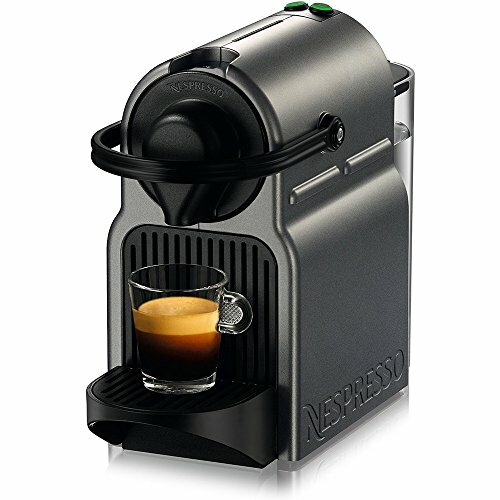 Even though this is the awesome espresso machine, it is great for making various coffee drinks as well. Lattes, Americanos, and cappuccinos are also on the list below espresso. The two sizes of Nespresso coffee capsules can be used while brewing your fix for the day. Both, the large and the small coffee capsules are compatible with this coffee maker. A folding drip tray is also available with the package. This is a super-compact machine. It doesn’t take up much space anyways and comes with a set of sixteen complimentary brewing capsules. You can taste a variety of brews right at home. The coffee maker has a smaller tank as compared to its counterpart. As the reservoir is smaller, it is much easier to move the machine around. The coffee maker is super light in weight. The reservoir is of 24-oz that easily holds around nine plus cups of coffee at one single go. The 24-oz. the reservoir needs to be refilled often. The high-pressure pump and the Nespresso deliver awesome, barista-style coffee every morning with unique aromas. It usually comes with Aeroccino 3 milk frother, which creates smooth and finely textured milk within seconds to complement your drink. There are two modes of usage in this coffee machine named espresso and lungo. These two modes help the user make a variety of drinks such as latte, cappuccino or Americano with just a touch of the button. The size cup can be adjusted in the coffee maker with the help of a folding drip. It avoids hassles and mess; the folding tray traps any accidental drips effectively. The tray is super easy to clean too. The coffee capsules are made of aluminium and are hermetically sealed off to preserve the aromas and taste and deliver the superb, café style coffee right at home. 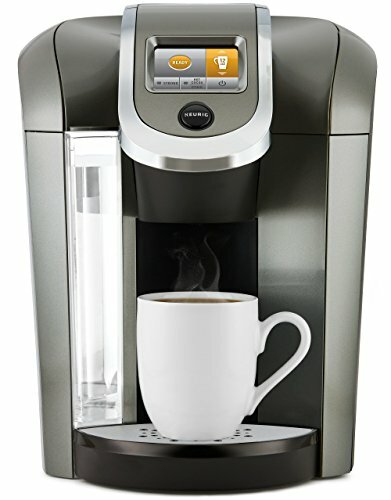 This machine is the choice for those who prefer premium coffee as their morning beverage. 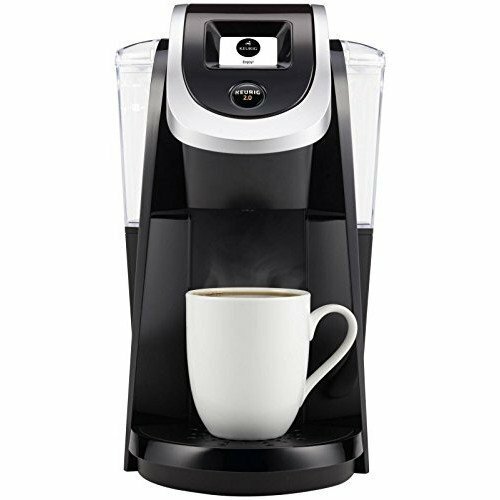 Keurig K575 Single Serve Programmable K-Cup 4.0 is a feature-rich complete coffee maker that is known to bring all of your coffee making dreams to life. This machine makes dense, mouth-watering aromatic and delicious coffee. You can also use this product to brew tea or hot chocolate beverage. Keurig has always tried to make products that make our day-to-day work simpler but K575 is a new level of the modern and advanced model. 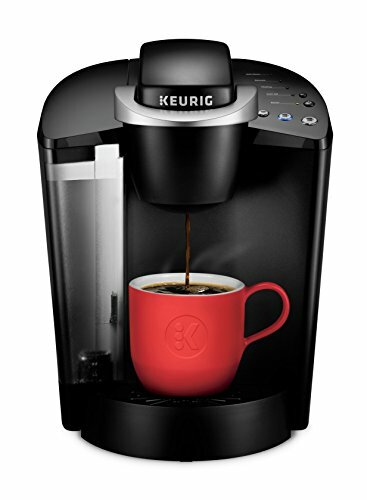 6 K-cups comes as a complimentary with Keurig 575 model. A touchscreen display makes coffee making programming easier for you. The machine’s compatibility with all K-pods sizes from Keurig is mind-blowing. This particular coffee maker comes with many features including temperature control that increases the strength of the brew. The bright large display keeps all the settings in check. This product can be called a classic and durable buy. The best feature of this product is that this one needs only seconds of refuelling in between two brews. Hence, you can make coffee for all your family in no time. All K-carafe, K-cup and K-mug pods right from 4 oz. to 30 oz. easily go with the machine. This makes it easy for you to brew coffee for even small get-togethers. The other feature of this product that makes it worth your money is that it is compatible with even third-party pods of coffee. This machine has an elegant, sleek and compact. It has a number of features that make it a number one of the best ones available in the market. You can easily use it to brew coffee for a small family and even for office purpose. With the reservoir capacity of 80 oz. makes it easy for you to make a large quantity of coffee at one go. When you buy any single-serve coffee maker you may start worrying about its maintenance but with Cuisinart SS-10 Premium Coffee Maker 4.5 you can forget your worries. You can stop worrying about the calcium build-up problem as well which is very common with coffee machines. The machine makes numerous varieties of beverages with you breaking a sweat. From espresso to hot chocolate everything becomes easy to brew with this coffee maker. This multipurpose gadget is a must for every coffee lover and belongs in every household. This product comes with 5 sizes of cups that start with regular 4 oz. and goes up to 12 oz. so you can easily get a big decent sized cup of coffee for yourself. You can even make soup with this machine. The reservoir holds up to 72 oz that makes 8 cups of coffee. The reservoir is detachable which makes it easy to clean and fill the reservoir. The machine is known to automatically shut off after the machine stands still which saves energy and time. There are numerous features that make it stand out from the rest of the coffee makers. The charcoal filter is reusable and keeps the water tank of the coffee maker clean. This not only makes it a good product in the matter of low maintenance but also environment-friendly. A thorough wash is enough to clean the machine. With all the good features the coffee still tastes great and maintains consistency. The product comes with blue- backlit panels that help the settings control for easy usage. You can also adjust the size and temperature and control the taste and strength of the coffee. This feature is helpful in case you are making soup or hot chocolate. Old traditional ones are hard work but these new models of single-serve coffee makers take only 2 minutes or less to brew a perfect cup of coffee. With just a touch of a button, you can make your work easier. How to Choose the Single Serve Coffee Maker? It is always important to keep the needs of the buyer in mind before purchasing a coffee maker. For example the reservoir size, pod size and control settings. The brand is another factor that is checked by many. Every brand comes with special features. Hence, it is very important to know which brand will cater to your purpose of buying a coffee maker. Reusable filters are not only environment-friendly but also helps you save time while changing the used filters. Those who want to brew coffee for small gatherings may have to check on pod sizes. For them, Keurig 575 can prove to be a better option. If you are planning on buying a coffee maker then you must do some researches before you get yourself one. With research, you may get to know which one is best to get your needs catered. The ratings, features, size of the reservoir and so many others help us in buying a product that will give our investments long life. So, before you go to buy a product you must make sure you get what you planned on getting and check reviews to be very sure about your decision. If you are planning on getting a holiday gift then you must try a single-serve coffee maker.